Safari Land Resort in Masinagudi is a good mix of rustic and comfort and sits right in the middle of the Mudumalai National Park. Plus, their treehouses get a thumbs up from us. We have already written about the super popular Jungle Retreat, one of the best places to park yourself while in Masinagudi, but the Safari Land Resort in Masinagudi is an equally attractive bet with its rustic treehouses. At the onset let us tell you that the treehouses are a bit steep (at INR 8,000 a night), but if two of you are splitting it (we are looking at you romantic couples) or even besties, then this is worth booking. Each of the treehouses come with a big room that literally opens out to the jungle. Everything is super rustic and eco friendly, but the bathrooms comes with a bathtub and you can even spot monkeys going crazy in bamboo groves while taking a pee. There are bamboo blinds that you can keep open when you are in the room and the large double bed comes with a quaint and lacy mosquito net for proper atmosphere. There is no TV here and WIFi is only available at the reception, but really do you need any of it? Each treehouse comes with it own sit out that overlooks a stream and the jungle beyond. You are in elephant territory, so don’t go near the fences because they are all electric ones. The grounds are pretty big and come with landscaped gardens, gorgeous and colourful bougainvillea creepers, a play area for kids, several swings and creaking ancient bamboo groves to give you the feels. There’s also a pool in the making which will be functional soon. The dining area is where you can get WIFI and there’s a library full of books to keep you occupied for hours. The food here is home style and you can get all three meals of the day (but breakfast doesn’t come in the package like most resorts). The menu is a nice mix of vegetarian and non vegetarian food with several choices for kids. The only thing you need to worry about is transport because charges are quite steep to arrange for vehicles to visit the nearby Bandipur National Park or Mudumalai Tiger Reserve (the resort is located in the same range) or the close by Ooty. So it best really if you bring your own car or hire one at the start of the journey. The drive down is really picturesque and passes through both national parks and your chances of seeing wildlife is quite high. We recommend you go for a day trip to Ketti near Ooty to eat an Italian meal at the lovely The Culinarium restaurant. Prior reservations is a must. 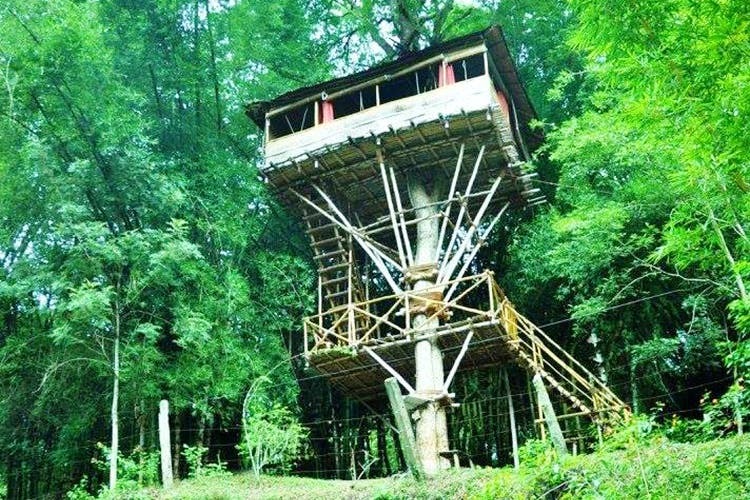 Price: INR 8,000 for a treehouse.